What Is the Shure SM57 Microphone? Who is the Shure SM57 Mic Designed for? 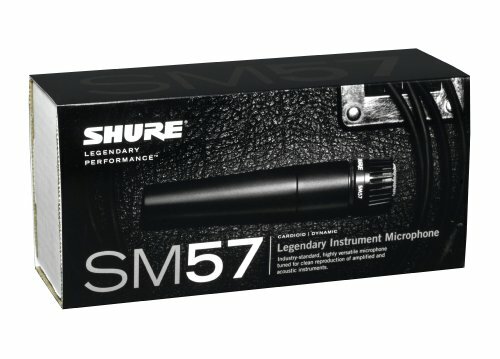 What’s Included with the Shure SM57 Mic? 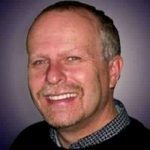 Conclusion – Should You Get Shure’s SM57? With the Shure SM57 mic, you get a professional quality sound reproduction that is suited for a wide range of applications. When you need a reliable microphone for less than $100, the Shure SM57 cardioid microphone may be a great choice. The Shure SM57 features a dynamic diaphragm with a cardioid pickup pattern for recording vocals or speech. It also has a slim profile and clean sound for use with instruments, including guitars and drums. Thanks to the slim design, the SM57 is also lightweight. It weighs about 10 ounces and measures just over six inches in length. It is a little bit smaller and lighter than a typical handheld microphone, it still feels durable. The durability comes from the die-cast metal construction and a steel grille. This is one of the few microphones that may survive getting dropped more than once. The quality of the construction is beneficial when your microphone gets a lot of use, especially for live performances every week at church. With the Shure SM57, you need to use the standard XLR connection. 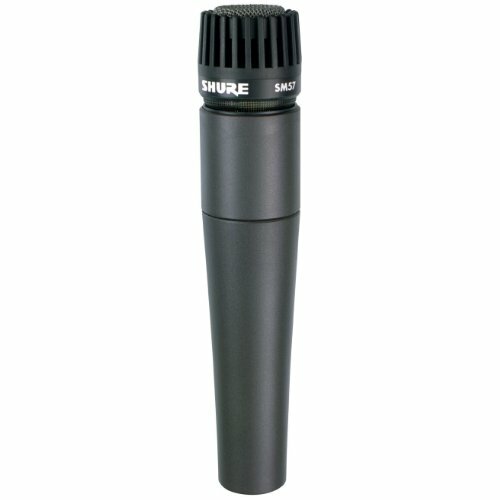 However, Shure does offer a separate version of the SM57 that comes equipped with an XLR-to-USB adapter. The SM57 is a staple of the Shure lineup of professional microphones. It was released in October of 2001 and still features the same design and construction. The Shure SM57 microphone was designed for musicians and is a common sight at live performances. Due to the versatility of this mic, you may see it used by worship teams in smaller churches or major musical acts in large stadiums. As with most professional microphones designed for musicians, the Shure SM57 is also able to handle a variety of applications. 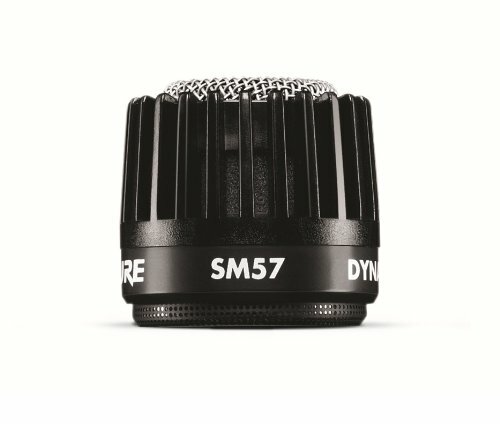 Besides live performances, the SM57 may be a great option for recording speech. If you need a microphone for live streaming, reporting, or public speaking, the Shure SM57 should meet your requirements. The clarity of the signal and the durability of the microphone make it suited for use in almost any setting. It is even the preferred microphone of the White House. Since the 1970s, presidents have used this microphone for public speeches. While the SM57 is built for recording vocals and spoken words, it is not specifically tuned for human speech. It can handle a wider range of frequencies compared to most microphones built for vocals, allowing you to use it as an instrument microphone. It is commonly used for high-volume musical instruments, such as drums. The Shure SM57 is also found in studios where it is often used to capture the sound of string, wind, and percussion instruments. When you purchase the Shure SM57, you are getting the microphone without any special accessories. The only other items included inside the box are the zippered leather pouch and a microphone clip. Shure’s SM57 does not come equipped with a windscreen or mic cable. However, Shure does offer several different bundles for the SM57. You can get a bundle with a stand, cable, and windscreen. There is also an SM57 with an XLR-to-USB adapter for connecting the mic to a computer. Another feature that stands out is the calibration of the microphone. Most vocal microphones are carefully tailored to vocals by focusing in on the frequencies most commonly produced by humans. With the SM57, the microphone simply captures clear, raw sound. The quality sound reproduction should suit just about anyone. However, there are vocalists that do not enjoy the raw sound. They are used to the bright, full sound produced by a typical vocal microphone. However, you can easily recreate this sound by adjusting the mic settings on the mixer or sound system. There are no major disadvantages to the SM57, especially when you factor in the price of the microphone. The SM57 is in the $100 range, which is a common price point for the lower end of the professional microphones. Despite the lower price, the SM57 is still suited for professional use. You get a wide frequency response range and durable construction. It is built to take a beating and last for years. In fact, Shure puts their microphones through a drop test. The SM57 was dropped 10 times from 10 feet without any loss of overall input quality. The closest direct alternatives to the SM57 include the SM58 and the Beta 58A. These microphones are in the same price range and offer comparable results. The main difference between these two alternatives and the SM57 is the calibration of the microphone. While the SM57 is not fine-tuned for vocals, the SM58 and the Beta 58A feature a brightened midrange and bass roll-off for brighter vocals. The Shure SM57 is one of the most versatile and affordable microphones built for professional use. It can be used for any application on stage or in the studio. You can use it for vocals, instruments, and even for recording speech. The SM57 has been a favorite choice since 1965 and can be seen everywhere, including the White House. There are several reasons why Shure’s SM57 is the microphone preferred by the White House. It delivers the clear, natural sound that you need to ensure that the sound of the speaker is captured exactly as it sounds when standing in the same room. It is also designed to provide many years of use and withstand impact damage, ensuring that you have a reliable microphone for any setting. For those that want the best value for their money, the versatility of the Shure SM57 provides a wonderful option. Are you looking for a quality wireless microphone system. Check out the Shure PGX wireless microphone system for your next gig or speaking event.